The length of 162 m vessel. It can accommodate a total of 115 people and has several dining rooms, guest, VIP suites and a beauty salon. It consists of eight decks. Dubai belongs to the Mohammed bin Rashid Al Maktoum, Vice-President of the UAE. «Business Insider» assesses the state of the monarch in the $ 14 billion. 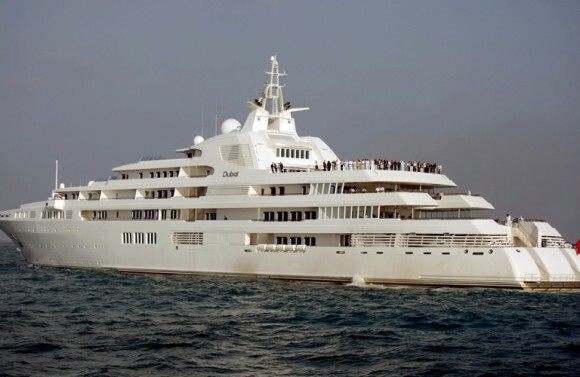 Sheikh of the Emirate of Dubai, Mohammed bin Rashid al Maktoum owns the third largest private megayacht on the planet, which has a patriotic name Dubai and a length of 162 meters. Megayacht Dubai was launched in 2006, and the final account at the completion of its construction amounted to more than $ 300 million. Several decks on board the Sheikh Dubai yacht are united by three elevators, and in its central part on all decks a transparent atrium is formed, around which there are swimming pools with sun beds for the opportunity to swim and sunbathe in natural sunlight at any level of the Dubai yacht. On board the royal yacht there is also a squash court, a spa, a cinema, a dance floor and a gym. On the upper deck is the landing pad for the Blackhawk helicopter, and in the garage on the lower deck a few high-speed motor boats and a mini submarine are transported.